Music in India is often considered to be very unique and vibrant. The traditional musicians in India did not use Western instruments like the guitar or saxophone. Rather they used the Sitar, Sarangi and the Dhol. It isn’t an unknown fact that India produces a considerable amount of soulful music. Some of the world’s famous musicians have taken inspiration from music in India as it opened up their minds and helped them find meaning. That is how Indian music has always worked and wouldn’t have succeeded working like this without the help of its unique instruments. 1. Construction: It is played using either one or two wooden sticks which are made of cane and bamboo wood. “Dagga” is the Punjabi term for the wooden stick which is used to play the bass side of the instrument, it is thick and is always bent in an arc on the end which strikes the dhol. The other stick, which is much thinner and also more flexible is known as the “Tihli” and is used for playing the higher notes. The growth of the folkloric staged dance Bhangra is associated with the popularity of the Dhol. This inspired the creation of several new rhythms which were added to the dance. Some of the other popular rhythms created out of the Dhol are the Dhamaal and Kaharva, which is a dance and song rhythm in the 1950s. Coming to the 1970s, many more dance forms and accompanying rhythms were added to the Kaharva, making it one of the most popular dance forms in the country. This form was very popular in Punjab especially, with the most prominent rhythms and dances with relation to the Dhol originating from there. Since then, the instrument has evolved and is now played in different parts of the country. 3. Festivals: The Dhol is linked to several festivals, mostly celebrated in the North and North Eastern parts of the country. 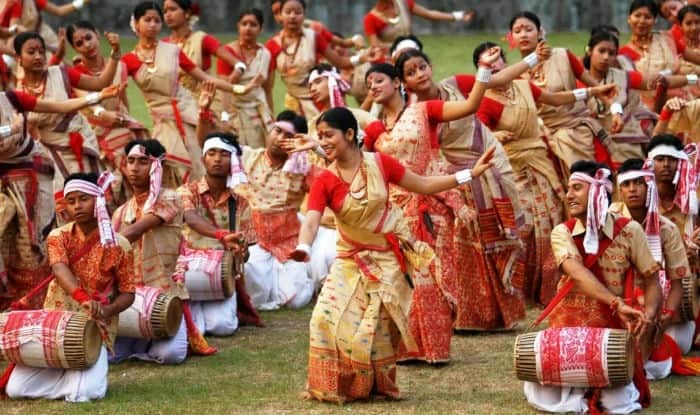 Rongali Bihu, the Assamese New Year, is one of the main festivals where the Dhol is extensively used. The Dhol is also used during the Shigmo celebrations in Goa as well as is an important part of Goan temple music. The festival of Navaratri in several states, but more prominently in the state of Gujarat, where it accompanies the folk dance of Garba. In Maharashtra, the Dhol is used during the Ganesh festivals. 4. History: The Dhol was first used in the 16th Century during the Mughal period. The Dhol is actually the more evolved form of the instrument known as “Nagarah” which was a single side drum made of a wooden shell along with a goat hide stretched with a rope. They were used to draw the attention of the crowd for public announcements, and were also used to draw the attention of the army about approaching enemies. The closer the enemies were, the more louder and faster the beats of the Nagarah were. It was most famous in the state of Punjab, where the harvest festival was celebrated with dances associated with the Dhol. 5. Preservation: With the evolution of time and technology, the Dhol has taken a new shape and sound. The traditional belly style Dhol has now been swapped with the straight barrel drum and the thin goat hide used on the treble has been swapped for a synthetic skin giving a brighter sound and better levels of sustain. The Dhol is now an instrument that is internationally recognized and due to the varying climates drums are now varnished or oiled to preserve the wood. As can be seen, the Dhol forms a very important part of Indian music. It has played a pivotal role in several cultures and is still revered all over the country. The preservation of such a significant part of Indian culture is important and is still happening in various parts of the mainland. We at the Mumbai Music Institute realize how important this instrument is to Indian music and teaching such an instrument like this can help preserve and promote the beauty of our culture. We urge everyone to see how vibrant the music produced by the Dhol is and how it can really inspire more people to come into the field of music.